Thanks to Amber Kingsley, who researched and wrote this article. We hope people will take heed. We have heard too many stories of people who won’t take their children to visit Grandma because her kitty has runny eyes or a runny nose, or worse yet, people who put their dogs or cats down because they seem to have a chronic “cold” although the pet is otherwise healthy, eating well and enjoying life. 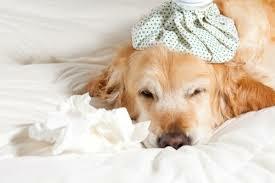 We humans often suffer from the common cold or a flu virus. When we get sick, we tend to steer clear of other people so as not to transmit the infection and “spread disease”. Because these illnesses spread quickly among ourselves, we may assume that our pets are also capable of transmitting their colds and upper respiratory infections to us. In our great-grandparents’ time, it was rabies that was a huge concern when it came to animals spreading diseases. It was especially problematic with wildlife like rodents, skunks, raccoons and other nuisance animals that could come into contact with us or our pets. Thanks to aggressive rabies immunization requirements for pets, it is very rare indeed for a cat or dog to infect a person with rabies. But what about our pets’ “colds” and “flu”? In a nutshell, if a companion animal has a virus that causes a cough, symptoms of a cold or the flu, the organisms that cause these symptoms are different for pets from what they are for humans. The bottom line is, “colds” and “flu” aren’t spread from animals to humans, or vice versa. If you’re sniffling and your four-legged friend is sneezing, this is only a coincidence and not a shared condition. Although it’s possible that you both may need to be seen by a doctor or veterinarian, the two aren’t linked within a shared virus. Beware, although humans usually have the ability to fight off a cold or the flu on their own, if a dog or cat is showing cold or flu-like symptoms, you should take them to see a vet immediately as these could be a sign of a different, more dangerous disease. Kennel cough got it’s name from how easily this disease is spread from animal-to-animal in close quarters, like conditions found in shelters or kennels. Although highly contagious, especially with canines, kennel cough or Canine Bordetellosis, is not transmittable to humans (note the word canine in the identification of this disease). Cats seem to be more susceptible to upper respiratory tract infections compared to canines and this condition is also highly contagious among felines. Just as humans carry bronchitis and viral pneumonia and can pass it from person-to-person, again, these are different types of diseases that aren’t interchangeable between humans and pets. Lyme disease: It is “humanly” possible (but highly unlikely) for an infected tick present on a pet to detach, transfer onto a person and thereby give them the disease from a bite. Thanks to the vigilance of most pet owners who ensure their animals aren’t bothered by fleas and ticks, they’re using medications help to keep these types of nuisances at bay. Salmonella: Reptile owners (snakes, turtles, lizards, etc.) run a much higher risk of contracting salmonella from these cold-blooded creatures since it’s commonly found in their feces. The majority of these pet owners are aware of this fact and take special care in cleaning their cages or confinement areas. Toxoplasmosis: This is actually a condition found mostly in the feces of cats and kittens. Almost a third of humans exposed to the virus are immune to the disease, but it can be problematic for pregnant women and their unborn fetus. That is why it’s recommended that women do not clean the litter box while they are expecting. Remember that you are far more likely to contract something contagious from a friend, family member, coworker or another human that you’re in constant contact with, rather than from a pet. 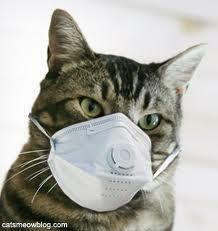 Don’t let the fear of contagion stop you from being a loving pet owner or visiting “Grandma” and her rheumy-eyed cat! 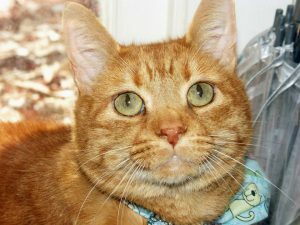 “SLINKY”: SAVED BY A MICROCHIP! Slinky went missing during a move last summer and was reunited six months later, just prior to Christmas! A woman had been feeding him outdoors about a mile from where we went missing. Not wanting to leave him outside all winter she finally got him inside, but he wasn’t having any of it. He was miserable being kept indoors and he was making her miserable. She was so exasperated that the took Slinky to a vet to be put down. Thank goodness the vet suggested checking for a microchip …..BINGO! In any case the vet would have had Slinky put up for adoption if no chip was found. But not all vets are as compassionate. Under other circumstances, Slinky might not have been so lucky. Some vets are victimized by their compassion. We know of one who has a large farm in northern Ohio that has turned into a sanctuary for unwanted pets she was asked to put down. Currently she is feeding and caring for almost one hundred cats and dogs! Slinky’s story is only one of many many we have heard – reunions that have taken place after months and even years, improbable reunions that would never have happened if the pet were not chipped. Microchips work! Have your pet chipped! Microchips are not expensive and they are not painful to insert. Sam The Cat Recovered After Six Years! This report was submitted by Sam’s Mom, Amy. He recognized her after six years of being lost! I found Sam as a feral kitten. He was the only kitten left in a litter that had been killed by a neighborhood dog. When I finally caught him he was a nasty little ball of hissing fluff, but he was safe. Eventually he came around and became a little more trusting of humans. I moved 3 hours away from my hometown where I lived with my significant other at the time out in the country and Sam was happy. He loved it there because he could be indoors but still go outdoors when he wanted. He had never really been able to adjust to being a strictly indoor cat. I worked at the local animal shelter and I got all of my pets microchipped while I worked there. I learned that it was such a wonderful way to protect my pets that I loved so very much. When my relationship ended I needed to move back to my hometown but I knew that Sam would be miserable there. I would be living in town, where it wouldn’t be safe for him to be outside. It was a heartbreaking decision but at the time, what I felt would be the best option for his happiness. I know now that I was pretty naive to think that. In almost every instance, no one else is going to love your pet as much as you do…. I kept his microchip info in my name and updated it to my new info. I found out that shortly after moving that my ex, for whatever reason, had to move and he just left Sam there. I made several trips back and forth, putting up signs around town and at the shelter where I used to work. I contacted the animal control officers and had them set out live traps as well as ride thru from time to time when they could. 6 years passed and every time I moved or got a new phone number, I updated his microchip info. Then one day, out of the blue, I got a call from that old shelter saying they had a cat named Sam there whose microchip was registered to me. He had been turned in by an elderly lady as her cat. She wanted him put down because he bit her! They said he acted quite feral and he was very sick. Luckily, instead of just taking her at her word, they managed to scan Sam for a chip. Six years he’d been gone. Had he turned feral again? Would he remember me? Was he going to be ok? I took a day off and rushed the three hours back to to pick him up. When I got there I walked up to the cage and he was huddled up in the back corner hissing. I called him “Sam Sam” as I used to do and he instantly walked to the front and I rubbed his head thru the bars. He was really snotty and sneezy and a little underweight but I’d imagined a lot worse on my long trip there. He was still my Sam Sam. He remembered me. I was so happy to have him back. We made the long trip back and many many trips later to the vet he was finally on the mend. He still hates being indoors all the time but he is now an indoor only cat. 1 Get your pet microchipped! 2. Keep the microchip registration up to date! 3. If you find a pet and the microchip information is outdated, Pet FBI may be able to help.you. We have a volunteer who has access to non-public subscription databases. He can cross reference and usually can come up with current contact info. Just use the contact link at the bottom of this page. 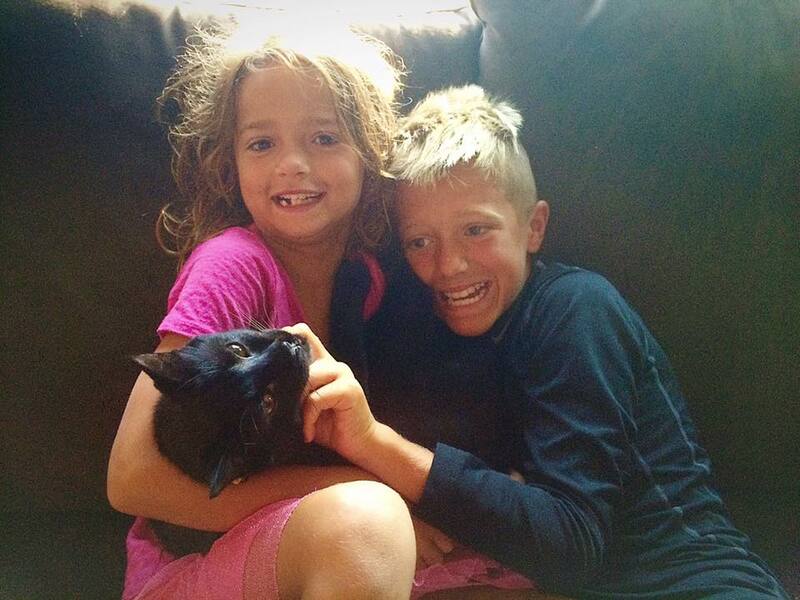 Long Missing Cat Reunited ! 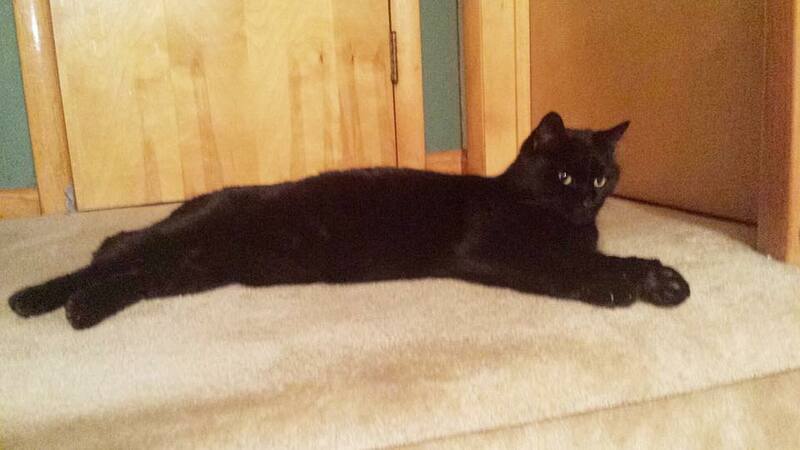 Spooky has been missing from his Delaware County home since September. Our Capital Area Humane Society volunteer Lisa R. recognized him from his Pet FBI Ohio post when she was checking out new arrivals at the shelter. Ten-year-old Spooky is now microchipped and on his way home to reunite with his kitty sister. Mom and Dad want to thank the Good Samaritan who brought him in. Moral of the Story for Pet Parents: Don’t give up hope too soon! 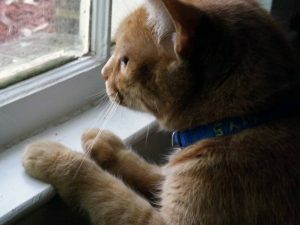 Moral of the Story for Shelters: Please take advantage of the lost and found pet database at PetFBI.org! Assign a volunteer to follow and post reports. People cannot get to the shelter often enough and long enough to assure recovery! Electronic cigarettes are a fairly new but major danger for pets. Designed to mimic the feeling of smoking without burning tobacco, e-cigs health benefits vs. risks are debatable. The answer depends on which public health organization you ask. 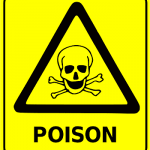 However something that is not being debated is the toxicity of nicotine. When ingested in high enough quantities it can have serious consequences. None of the ingredients (apart from nicotine) in e liquid are toxic to ingest. They are food grade chemicals and flavorings that are used in things like toothpaste and candy making. This makes e liquid smell and taste very sweet. 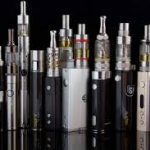 Because of this sweet taste the e liquid becomes very attractive to animals, who will relish the opportunity to eat such a sweet yet toxic liquid. They have no idea poisonous nicotine is also present. Ingesting even a small portion of a bottle of e liquid has a very high chance of killing an innocent animal. A tragic recent news story emerged regarding a Staffordshire bull terrier named Ivy from the UK. Ivy managed to get hold of a bottle of e liquid that was left on a dining room table and she started chewing on it, only ingesting a tiny amount. She then immediately started vomiting and foaming at the mouth. Ivys owner took her to the vets who gave her a large dose of steroids to try and save her. However Ivy unfortunately passed away from nicotine poisoning the next day. With the amount of people quitting smoking using e-cigs rising every year, the tragic story of Ivy is unfortunately unlikely to be the last we hear of this issue. But there are simple actions any responsible e-cig using pet owner can take to ensure this tragedy does not happen to them and their animal. It’s crucial that vapers keep their stash out of the reach of pets. That means you should throw away your old cartridges as soon as you’re finished with them. Even if you think they are empty, they could still contain trace amounts of nicotine that would be dangerous if your pet ingested it. … The liquid nicotine is deadly for animals. The first signs of nicotine poisoning in a pet generally begin within 30 minutes to an hour. Usually, the first symptom is vomiting. Pets might also develop diarrhea, drool uncontrollably, act agitated or have a fast heart rate. 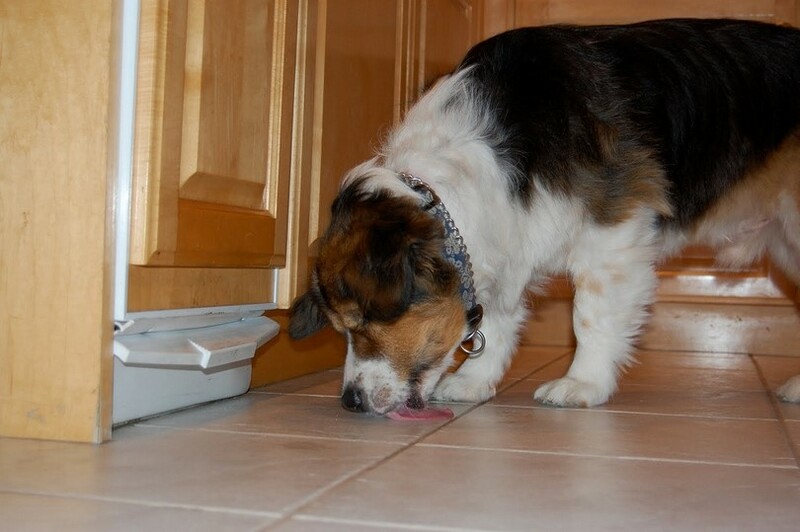 If your pet consumes a higher dosage, you will see seizures or extreme lethargy. In some cases, the accident can turn fatal quickly. Liquid nicotine poses a particular threat because it is quickly absorbed through mucous membranes in the pet’s mouth. If your dog eats a cigarette, the liver has a chance to absorb most of the toxicity. However, liquid nicotine gets absorbed before it ever reaches the stomach causing a more immediate risk and a real emergency. If your pet accidentally ingests a cartridge or gets into your eliquid, call the vet right away or contact the ASPCA Animal Poison Control hotline at 1-888-426-4435. Thanks to Chloe Bloom for contributing this guest blog about an issue very important to your pet’s health and longevity. The dangers of passive smoking have been known for some time now. Without a second thought we protect our children from its harmful toxins. However for some reason many people do not seem to be aware that the same dangers that humans face from second hand smoke also harm animals too. Several studies have been conducted on this topic. They have produced some rather worrying results. Researchers examined the medical history of two groups of cats. One group had lived in homes that were regularly smoked in, and the other group were from non smoking homes. They found that by living with a smoker that smokes inside their home, cats are twice as likely to be diagnosed with lymphoma after one year. If the cat lives in a smokers home for five years or more they are three times more likely to be diagnosed. Its not just cats either. There are a growing number of studies that have been done on other popular species of pet. Third hand smoke is something that many people are unaware of, mainly because it is a new concept. Third hand smoke is the residue that is left behind by cigarette smoke. It gets everywhere when a home is smoked in, and it will stay there for several weeks. Humans (with the exception of small children) are not usually at risk from third hand smoke. Mainly because it is most dangerous when it is ingested. We keep most of our food in sealed containers, and do not put many household objects in our mouths – limiting the amount of exposure. However our pets often use their mouth to explore their world. In a smoking household, every time our pets do anything with their mouths they are ingesting carcinogenic third hand smoke. Every time they eat, or drink, or pick up a toy or groom themselves they are being harmed. I am sure no one reading this is intentionally harming their pets by smoking inside the house with them. So what can be done? The best thing a smoking pet owner can do to reduce the amount of exposure that their pet experience is to quit smoking. But in the meantime there are a few things you can do. The main step you can take to protect your pet is to always smoke outside. Never smoke indoors. Just one cigarette will coat your entire property in third hand smoke. Researchers who investigated third hand smoke found any other method was ineffective at reducing its spread. So this means things like opening a window, or smoking in a separate room to your pet will not be enough to reduce their risk to acceptable levels. Even when smoking outdoors your pet will still be exposed to third hand smoke as it clings to your skin, hair, and clothes. But smoking outside is a significant improvement over doing nothing at all. So if you are a smoking pet owner, please smoke responsibly and smoke outside. Our pets are part of the family. Protect them from your smoke like you would protect your child. 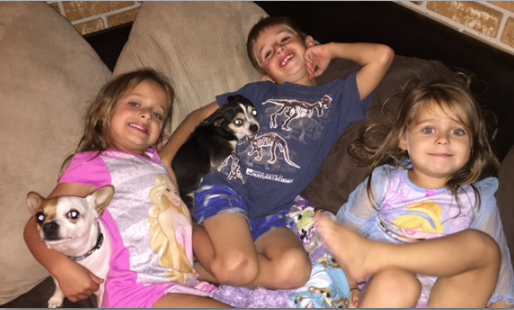 The darling little chihuahua snuggled up to the little boy in this photo went missing in Columbus, OH. At the time, she was not wearing a collar or ID tag. She was picked up by a Good Sam who submitted a Found Dog report to the Pet FBI database. Fortunately, the pooch’s family also thought to use the Pet FBI database, searched the “Lost Dog” reports, and there she was! A speedy, efficient reunion, thanks to technology and the Pet FBI site which is well known and widely used, especially in Ohio. We have been helping people recover lost pets in Ohio since 1998 with great success. This story was reported to us by Pet FBI Special Agent, Teresa. She heard about the virtually instantaneous reunion when she contacted the person who posted the Found Dog Report only to learn that there had already been a reunion. All too often, people who have lost or found a pet only post in one place and stop there. This is where our Special Agents like Teresa come in. They look for match-ups on many other online resources like Craigslist and alerts from microchip companies, and they often contact posters to remind them of other important resources. Our goal at Pet FB is to achieve the same high level of success that we have in Ohio on a national scale. It has been just a little over two years now that we extended our database to cover the entire US, including Puerto Rico and the US Virgin Islands. We were awarded a Google Adwords grant which allows us to have our link show up high in search results, but what is really needed is a grassroots effort for people to tell their friends about Pet FBI. We have a Facebook page for Ohio with almost 43,000 friends but to be optimally effective, more people need to use the database. Nowadays, lost and found pet Facebook pages are hugely successful in recovering lost pets, but only for people who have a Facebook page (and there are still plenty who do not!) and only in the short term. Posts tend to get buried pretty fast and that is where a searchable database is especially effective. You May Need to Trap Your Lost Cat! Until you have actually faced the situation, you may not realize that your lost cat will not come to you readily. 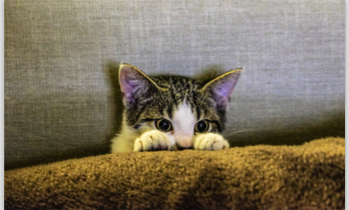 Inside cats that end up lost outdoors are especially likely to be fearful. In a strange environment, with new smells and unfamiliar surroundings, they suddenly revert to their wild instincts. Even you, their cherished “human”, provider of food and comfort, will be perceived as a threat by a nervous lost cat. Here’s an account of such a situation by Shain. He had tried all the tricks we suggest on our Tips To Lure A Cat Back Home page without success. Ok sorry to bother you but I wanted to let you know I came home from work and went searching again. Mitty must have been stalking me. I was about to call it a night and as I turned around to come back there she was. Terrified. Would not let me near her; kept growling and making a loud breathing sound right before she would hiss. I let her smell my hands and she let me pet her head. 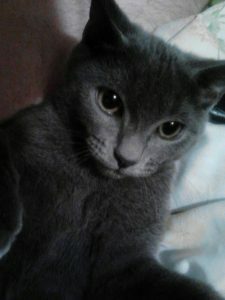 But when I grabbed her she scratched but I didn’t let go and when I brought her to my chest she didn’t scratch anymore. Once we got home she started to calm down but not completely. She ran straight to her food bowl and is now still in predator mode watching every move me, my wife or our other cat makes. She’s giving me the soft slow blink though so she’s calming down. Thank you so much for your help and I hope your page helps many more cat lovers find their babies. Later Shain reported that the kitty hissed and even attacked if he got close, but as soon as he went to bed she jumped up on the bed with him and and ran up to his neck as she used to, curled up and went right to sleep. Finally she is back to her old self. Shain was fortunate that his kitty let her presence be known and he was brave enough to hold on even when she scratched. For others dealing with a cat that won’t come to you, you may have to consider setting a humane trap. You may be able to borrow a trap designed to catch cats from a local TNR (Trap-Neuter-Return) group in your area, or from your local animal control. If you are in a remote or rural area.consider ordering a trap online or buy one from a tractor supply or farm store or even Walmart. You will find detailed instructions about trapping in many places online. We are writing this at the request of the Josie’s family. It is a sad story but may help prevent another tragedy. When Josie’s family moved from Ohio to Texas they had the movers pack for them. They did not want to stress Josie and their other cat by confining them all day so they were not shut up and Josie’s Mom monitored the open doors in case they should run out, although both cats were “inside” cats. 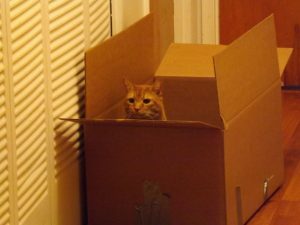 When the truck was packed and ready to leave Josie could not be found. The family was anguished and paid the movers extra to unload all the boxes they had just packed – open, inspect and reseal them. They were terrified that Josie had jumped in and been shut up. But Josie was not found in any of the boxes. The family delayed their own departure as long as they could. A very kind and helpful neighbor borrowed a trap from Pet FBI and faithfully set it out every night in hopes that Josie had somehow slipped out of the house on moving day and could be caught. Meanwhile, days later, the moving truck arrived at the warehouse in the other state but the contents could not be delivered due to a delay in being able to occupy the new house. Josie’s parents who were anguished with worry even had a friend go to the warehouse and again inspect the boxes. 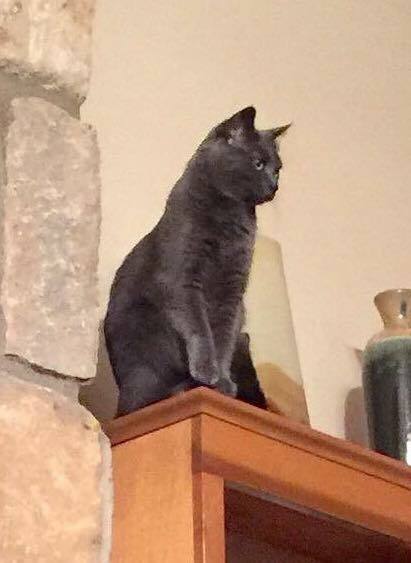 Hopes ran high when a cat resembling Josie was spotted in the old neighborhood. Finally after a week the cat was trapped and all were elated …. until it was confirmed that the cat that was finally trapped was not Josie. Eventually, the family was able to take delivery of their household possessions and the father carefully inspected each item personally to spare his wife any unpleasant surprises. This story does not have a happy ending. Josie was found dead on the shelf of a sewing cabinet where she had evidently hidden. The cabinet had been shrink-wrapped and thus sealed, Josie probably died of asphyxiation. The only consolation in all this is that it was a at least a gentle death. The family had feared that she would die of heat and thirst in the moving van. Josie’s family has asked that we share her story in order to spare others a similar tragic experience. Confine your pets on moving day. We would also add, in regard to moving, that when you arrive at your new home – do not let your pets out without supervision. It may take several weeks before a cat gets the lay of the land and the risk of getting lost is reduced. Pet FBI gets a great many reports of cats gone missing right after a move. In any case it is always safest to keep cats inside – there are just too many hazards for a free-roaming cat. Our heartfelt condolences to Josie’s family and the faithful neighbor who helped. Josie’s little feline companion is reportedly also grieving. The temptation to be overwhelmed by guilt is great, but Josie’s family should take comfort in knowing that they did everything possible to help Josie and that while she was with them she enjoyed the best life a cat can possibly have. That is so much more than 9 out of 10 cats born in our great country ever have. How To Earn Money for Charity By Shopping! Do you shop online? Doesn’t everybody? Here’s an easy way to support Pet FBI and help us get more pets back home. All you need to do is sign up for igive.com before August 31 and shop within 45 days of joining. If you are a new member, Pet FBI will receive $10 or you can chose to share half with any other registered non-profit you choose to support once you make your first purchase. Just about every major online retailer participates in the iGive program, almost 2000 of them. Each time you make a purchase the retailer donates a percentage to Pet FBI. If you are like the average member you would earn about $50 per year for your charity – all without any expense to you. Please forward this invitation to your friends. 1. New iGive members only (never joined before) and they must shop within 45 days of joining. Please help us get more lost pets back home. Click here to donate!